How much do you know about how smartphones evolved? The world before smartphones was cold and unforgiving. People waited in lines for minutes on end without entertainment. Bar arguments ended in fisticuffs or someone finally exclaiming “I guess we’ll never know!” Ignoring friends and relatives at the dinner table required ingenuity and imagination. They truly were dark times. Jokes aside, smartphones have irrevocably changed our lives. Mobile internet access allows employees to work from anywhere, while countless apps help people file their taxes, track their spending, or simply stay in touch with old friends. But how did our pocket computers get their start? Discounting earlier technologies like the unreliable WWI wireless field telephone, the accepted birthday for the cellular telephone is April 3, 1973. Standing near a 900 MHz base station in midtown Manhattan, undoubtedly surrounded by bell bottom jeans and crocheted midi-dresses, Motorola employee Martin Cooper dialed the number of Bell Labs in New Jersey. We don’t know exactly what was said on this call. We do know that Cooper used the Motorola DynaTAC 8000x, a product that wouldn’t go on sale to the public for another decade. But that call was the beginning of a mobile revolution. By 1979, Nippon Telegraph and Telephone (NTT) introduced the first ever (analog) 1G phone service in Tokyo. 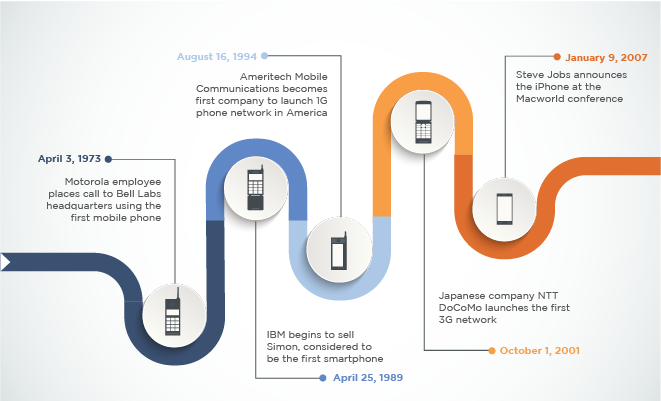 Although NTT gave Japanese consumers the first access to mobile phone service, it was several years before the technology moved into the mainstream worldwide. On October 13, 1983, Ameritech Mobile Communications became the first company to launch a 1G phone network in the US, starting with Chicago. 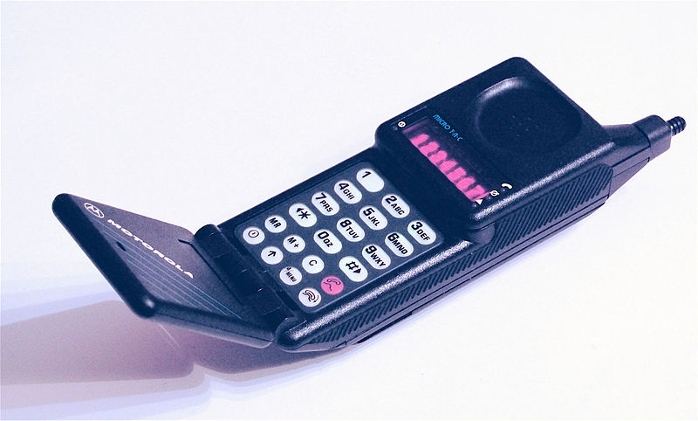 On March 13, 1984, the Motorola DynaTAC 8000x of Cooper’s call finally went on sale—for $3,995. The 8000x wasn’t very mobile—it weighed almost two pounds and took ten hours to charge for thirty minutes of talk time. By April 25, 1989, the Motorola MicroTAC 9800x showcased true mobility with its (relatively) compact size and flip-up mouthpiece. Of course, they both still had antennae, and could only be used to place calls. Simon says the future is calling. Introduced in 1994, IBM’s Simon was ahead of its time, equipped with a touchscreen, calendar, address book and email capability—all before most people had even heard of the World Wide Web. Courtesy ColdFusion. 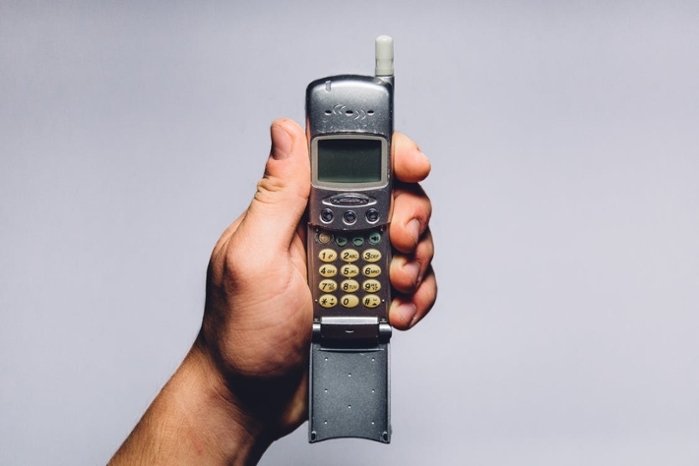 Appropriately for a decade that saw the reunification of Germany and the official formation of the European Union, the first GSM call was made in 1991. The GSM standard established a common network across Europe and provided users with uninterrupted service even when they crossed borders. The first GSM phone, the Nokia 1011, which went on sale November 9, 1992, also introduced text-messaging. And here’s where we preview the smartphone. When IBM’s Simon was released on August 16, 1994, it was a bit early to the game. You could send email (and faxes! ), sketch on its touchscreen with the included stylus, and consult the calendar, world time clock, and address book. 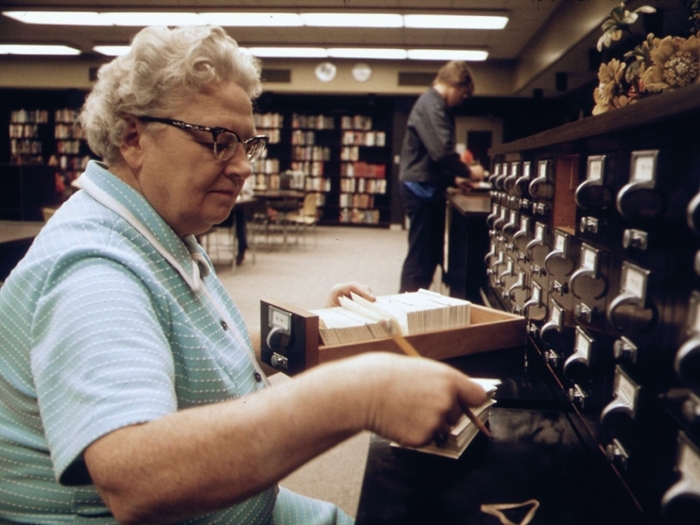 But you couldn’t surf the web—after all, NCSA’s Mosaic browser had only appeared one year earlier and home computers were just starting to adapt. The day we lost our attention spans. When Steve Jobs introduced the first iPhone at Macworld 2007, the world was more than ready. Courtesy Jonathan Turetta. If the smartphone was born in the nineties, then it came of age with the millennium. NTT DoCoMo launched the first 3G network in Japan on October 1, 2001, making videoconferencing and large email attachments possible. But the true smartphone revolution didn’t start until Macworld 2007, when Steve Jobs revealed the first iPhone. Previous phones relied on keypads and could only navigate a watered-down version of the internet. The iPhone’s large touchscreen could flip through websites just like a desktop computer, all while looking sleeker than anything consumers had ever seen before. So here we are in 2018, and worldwide use is expected to pass five billion by 2019. We use our phones for so much more than calls: dating, job-hunting, reading books, and watching movies. Maybe that’s why we’re seemingly unable to put them down for even a moment. 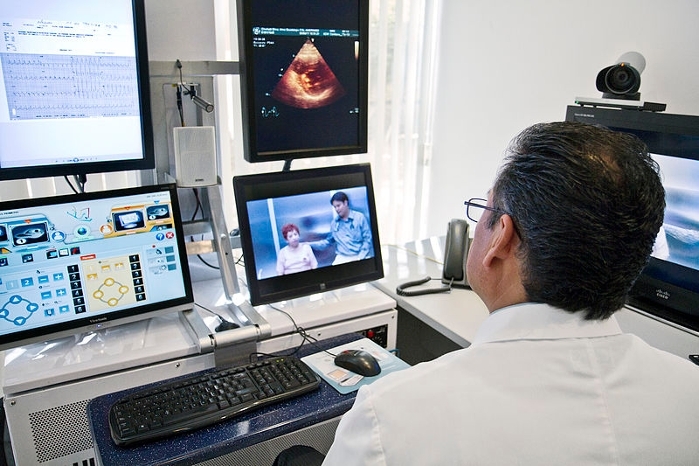 The 5G networks predicted for 2020 promise even faster speeds and increased bandwidth that experts think may enable life-changing technologies like real-time telemedicine, virtual reality training, and truly smart cities. With that kind of connectivity, a smartphone might become your next (and only) work computer. Scientists are even experimenting with building a supercomputer out of smartphones. The smartphone’s journey may not be very long, but it’s definitely going places. Nobody knows what the next Simon or iPhone will be, but we do know that whatever it is will be incredible. *It was actually Burt Reynolds.